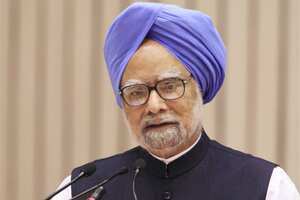 New Delhi: India can “swim against the wind blowing from abroad" and achieve the growth of 8 to 8.5% this fiscal, Prime Minister Manmohan Singh said on Thursday. Noting that the 12th Five Year Plan (2012-17) has targeted economic growth of about 9%, Singh said “it is difficult in the present world situation", but added that he believed it is achievable if more emphasis is laid on development of infrastructure, health and skill development. “Just as in the year 2008 we showed to the world that we can swim against the wind blowing from abroad, it is still possible for India to maintain a healthy growth rate of about 8 to 8.5% (2011-12) despite the adversity of the international environment," he said. Asked how India could protect itself from the global economic crisis, he said, “We have to ensure that the ill winds from abroad do not affect the growth processes in our country adversely. And for that it is very essential that we maintain the tempo of investment, particularly investment in the infrastructure sector, investment in agriculture, investment in energy saving technologies." The economist-Prime Minister said India will have to “walk on several legs" to achieve the “most important task" of getting rid of chronic poverty, ignorance and disease which still afflict millions and millions of people in the country. "We have to ensure that the country’s economy grows fast enough. The 12th Five Year Plan has the target of about 9% growth rate. It is difficult in the present world situation but we believe it is achievable,“ Singh said. He said if lot more emphasis is simultaneously laid on infrastructure, education, health, skill development, “we will create an environment where the youthful population profile that we have, will create not only higher growth rates but also create jobs of productive quality for young men and young women who would be joining the labour force." Queried whether he was worried that the protests witnessed in the Wall Street and Europe could get replicated in India, Singh said peaceful protests are a “part of functioning of any democratic polity." He said there are reasons as to why people are protesting in Wall Street and in Europe, and they include fat salaries that the bankers are getting when people are being asked to tighten their belts. “There is problem of growing unemployment in United States. There is also worry in Europe also. So, these are problems which the system must have credible answers to take them on board," Singh said. “I think democracy that way provides outlet for people’s frustrations, which I think is a very timely warning, for all those who are in charge of the processes of governance," he said. About his expectations from the Cannes Summit of G-20 countries taking place early next month, the Prime Minister said the developed countries, particularly the euro-zone countries, ought to come up with “credible measures" to resolve the crisis of the sovereign debt “which now is becoming a major global concern".